Since the Fly Emirates sports sponsorships, the United Arab Emirates (UAE) has become better known. 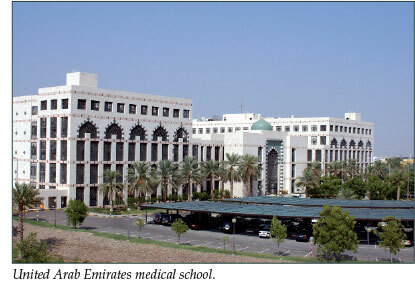 The medical school is outside Dubai at a collection of seven oases, the birthplace of this country's founder, Sheikh Zayed. His son, Khalifa, gave the money out of his personal fortune to build the magnificent medical school, one of the most beautiful buildings in the Gulf. Only seventy per cent of the building is used, and the spacious libraries and computer laboratories are usually quiet. The building is divided into separate halves for females and males, and we teach the sexes separately - a sort of gender apartheid. A faculty chaperone must be present if there is to be a meeting of both male and female students. Female medical students comprise between seventy and eighty per cent of each year. All dress in the black abayas with head scarves (shailas), and about a third also wear the face veils (niqabs). Teaching or assessing a veiled student who is consulting with a veiled patient, both speaking in Arabic, which I do not understand, is a challenge! Surprisingly it is possible to evaluate consultation skills, partly by intuition, non-verbal communication and experience, and we are researching this area of assessment and appraisal. These educated young women are very keen students and I appreciate their courage in facing the many daily challenges. Theirs is a changing world, often set against a traditional unchanging Arab world. 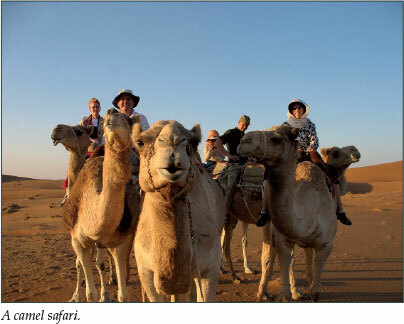 They are the grandchildren of Bedouin being taught in their second language, and their learning experience involves Western medicine and simultaneously absorbing Western culture. Their cultural background comes from reading the Quran and from Oprah Winfrey, with some Dr Phil thrown in! When explaining some ethical or humanistic concept I often tell historical stories or social narratives to set the scene before discussing the actual problem. One of my interests is teaching medical ethics, but teaching Western ethics in an Islamic country is like stepping through a minefield. I often receive firm rebuttals of concepts I thought would not be controversial. This may be because the students live the traditional way at home, but the 21st century is in their faces when they step into Dubai's streets. Dubai is a city of superlatives, with the tallest building in the world, the soon-to-be biggest theme park, the most valuable horse race, the biggest prize for a road marathon, a seven-star hotel and the world's richest golf tournament. The place is mushrooming with hotels, golf courses, artificial palm islands out at sea, game reserves and acres of high-rise shopping malls. Driving around the city at present is a nightmare. It is like one great construction site, with the much-quoted figure of a quarter of the world's construction cranes and heavy machinery to match. Literally kilometres of trucks and cement mixers continually move around the ring roads. Out in the desert, life quietens down. 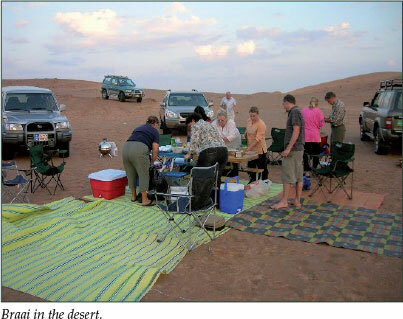 Over a weekend, off in a convoy of 4X4s for a braai in the dunes under a cloudless Arabian night sky, you would not imagine there was anyone else in the world. Many are deterred from working in the Middle East because of the conflicts in Iraq and Lebanon and the uncertainty over Iran. Nevertheless the Gulf States of Qatar, Bahrain, the United Arab Emirates and the Sultanate of Oman seem to be pursuing a peaceful evolution while edging towards partial democracies. There is more freedom for women, who are allowed to drive, freedom of religious practice, and limited availability of alcohol at hotels and licensed outlets. Personal security is not an issue, and our neighbour tells us that we are the only people in our complex who lock the front door - psychologically it is difficult for us to get out of this habit, so we continue to do so. In the hot months of July and August I park my car outside our local supermarket (full of South African fruit and produce) with its keys inside and the engine running to keep the air conditioning on. Petrol is a third of the price of South Africa. (I do worry about my carbon footprint, but it is 45 degrees most days in summer!) At first I continually popped out to check that the car was still there, among the other cars whose engines were also turning over. But hardly anyone in this country has even heard of a car being stolen. I thought somehow that teaching would not be so difficult, but after thirty years in clinical practice the change to full-time teaching has involved a steep learning curve. I found having to focus on the student and the patient in the clinic particularly difficult. I also miss the contact with patients with whom I can talk on a personal level, which I am looking forward to resuming when we return home.